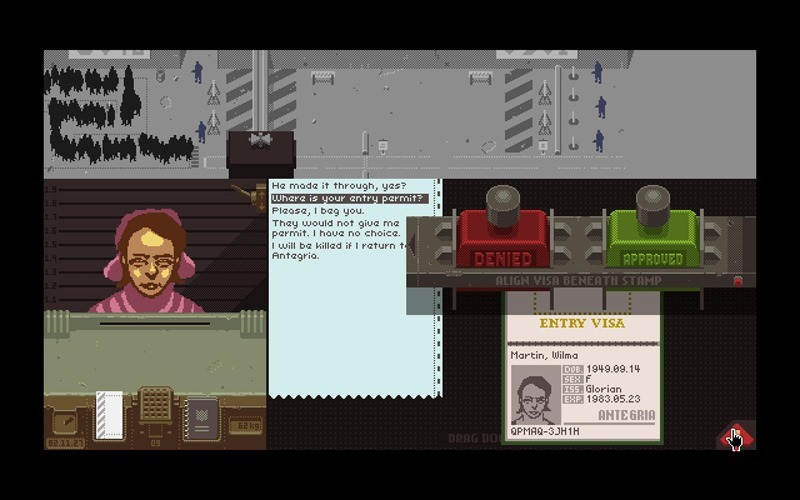 Latest Humble Bundle will ask you for your Papers, Please. Every gamer has the same nightmare: So much time, no games to play… wait, that’s not right, it’s the opposite! If your backlog is anything like mine, you’ll want to steer away from this news. The new Humble Bundle is overpriced and has nothing for you. Turn back! Alright that was a terrible lie. The latest Humble Bundle is packed with all sorts of indie goodness. Normally, these games would cost you a whopping $127. Not today though, because you can help yourself to some of them for the measly admission fee of $1. Glory to the Humble Indie Bundle! Waiting in line all day at the border, grasping papers and wallet in hand. You knew this day would come at long last, a return to the homeland and where it all began. Pay what you want for SteamWorld Dig, Hammerwatch and Gunpoint. If you pay more than the average price, you’ll also get Papers, Please, Gone Home and LUFTRAUSERS. Those who pay $10 or more will receive all of the above, plus early access to Prison Architect. For those with true devotion for the nation of Arstotzka, paying $65 or more will get you the entire bundle as well as the exclusive Humble Indie Bundle 12 Entertainment System, containing a 30-page issue of HIB Informer Magazine, two lapel pins of the Humble Bundle logo and Arstotzka Crest from Papers, Please, a HIB 12 Super Shirt, a HIB 12 Shareware 3.5" floppy disk, the HIB 12 EP on vinyl and a collector’s box for the entire package. Worldwide shipping included! What’s new to this bundle (as far as I know) is that loot you get for paying more than $65. A Vinyl and a floppy disk? There definitely is nothing more hipster than that! If you like to take pictures of your food, you may want to consider putting in that extra money. Ok, who am I kidding, I want that swag, and for no particular reason other than I think it’s pretty cool. Remember, you can choose exactly how you want to split your purchase of this bundle. You can give cash to the developers, Humble Bundle themselves, or to charity. 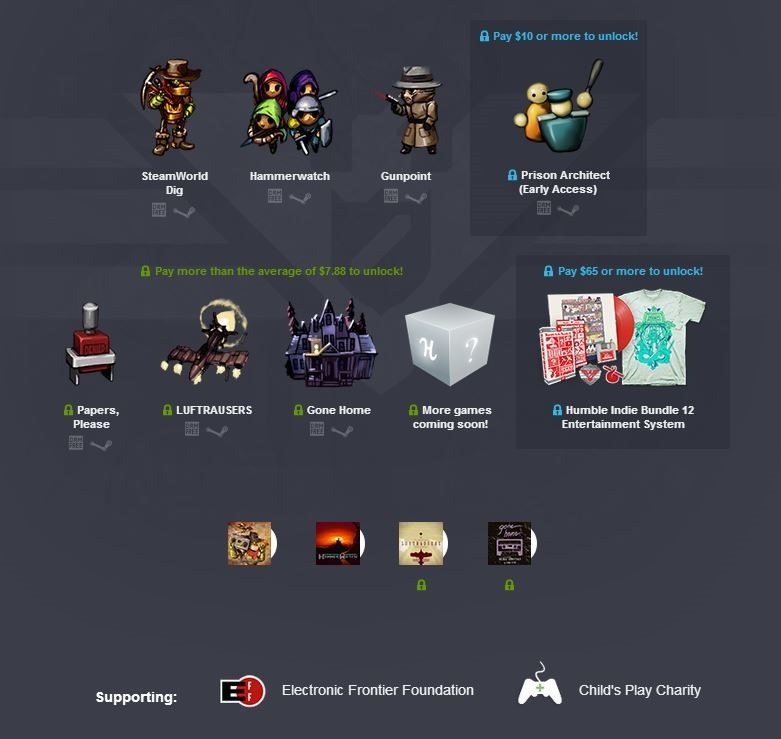 The charities for this particular bundle are the Electronic Frontier Foundation and Child’s Play Charity. What do you think of this bundle? Will you be splashing out so you can acquire the hipster goods? I totally would if I wasn’t as poor as the rain conditions in Joburg at the moment!